The Haldenstover originated in Norway. 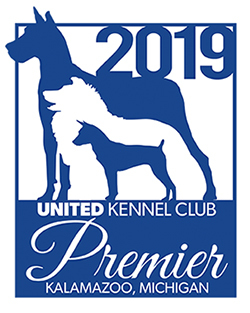 The Haldenstover was recognized by the United Kennel Club in 2006. A slightly rectangular dog, strong but not heavy, with a proud appearance. The medium sized head is clean and well balanced. The skull is slightly domed. The occiput is not prominent. The stop is not abrupt. The muzzle is fairly long, with a straight nasal bridge. The lips cover the lower jaw but are not pendulous. The cheeks are relatively flat. The Haldenstover has a complete set of evenly spaced, white teeth meeting in a scissors bite. The nose is black, with open nostrils. The dark brown eyes are medium in size, and have a tranquil expression. Set neither too high nor too low, the ears should reach the middle of the muzzle when pulled forward. The neck is rather long, strong, and clean. The shoulder blades and long and oblique, with strong muscles. The legs are straight and lean, with strong bone. The pasterns are slightly sloping. The chest is deep, with well sprung, but not barrel shaped, ribs. The back ribs, especially, should be well developed. The back is strong, and the topline is straight. The loin is broad and muscular, and the croup is slightly sloping. There is a very slight tuck up. The upper thigh is broad and muscular. The stifles are well angulated, and the lower thigh is long. The hocks are lean, broad and well angulated. The feet are oval, well arched, and close knit. The tail is set on the line of the croup. It is rather thick at the base, and long enough to reach the hock. It is carried somewhat low. Short, harsh, dense and straight, with undercoat. 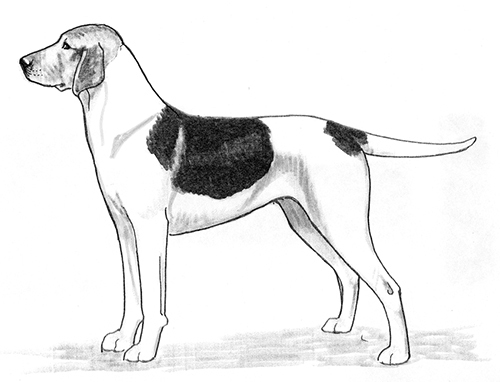 White, with black patches, and tan shading on the head and legs and sometimes between the white and the black patches. Black must not predominate. Small black or tan spots are regarded as mismarks. Height at the withers for males is 20.5 to 23.5 inches. For females, it is 19.5 to 22.5 inches. Light, ground covering, and parallel.